When undergraduates enter a college cafeteria, they often don’t expect much. A few miscellaneous vegetables, various sets of fried foods and a reliably consistent mediocrity. As for the people, it depends; sometimes you sit with friends, sometimes by yourself and on those rare few occasions, you get the honor to sit and eat lunch with 2,000 Cadets from the Japanese Self Defense Forces. 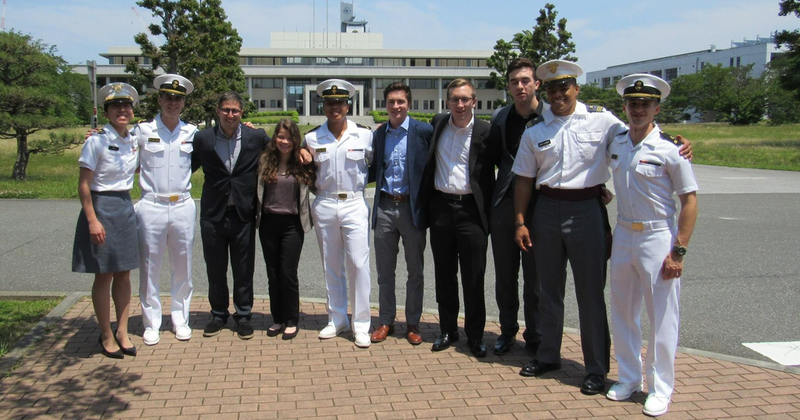 About a week and half through our ALLIES research trip to Japan, I along with three other Tufts students and three students each from the United States Naval Academy and the United States Military Academy at West Point were going to visit the Japanese National Defense Academy; an unexpectedly unintimidating complex located just over 50km outside of Tokyo that houses the academies for all three branches of the Japanese Self Defense Forces (SDF). While the name Self Defense Forces may sound like it has to do more with martial arts then military, it is a purposefully chosen title that enables the Japanese government to remain within the realm of constitutionality (it is illegal under Japan’s 1946 American-made constitution for the country to possess any “land, sea, and air forces, as well as other war potential“). On our train ride in, war potential seemed to be definitely present. Outside the windows, we could see numerous Japanese naval vessels—all with their naval shades of dark and very dark grey—floating off of the eastern coast of Tokyo Bay. Those hulking beasts abreast the Japanese shore looked like war potential to me, but who was I to judge? We had all come to Japan to explore various aspects of Article IX of Japan’s Constitution and how the country was thinking about how to meet its security needs in the Pacific in the context of North Korea, China and the new U.S. Administration. We entered the complex to little fanfare and were given a tour around the base. We remarked at the large clock tower standing starkly at the center of the campus, which includes an English inscription because the Japanese characters would have been too difficult to print, as noted by our guide. Fairly soon after entering, we were on the way to our aforementioned lunch. Once at the hall, we were met by applauding Japanese cadets and we followed them into the cafeteria. Upon descending the ramp into what seemed like a massive warehouse, we were met with a sight and sound I will never forget—that of 2000 Japanese SDF Cadets standing and applauding as we entered. We were all absolutely dumbstruck, flabbergasted. We wanted to tell them how unimportant we were, how unnecessary all of this was, but it wouldn’t have mattered, and nothing that we said would have been audible above the roar of clapping hands. We snaked through the lines of lunch tables and arrived at our own—but the applause continued. Eventually, we got the memo, took a seat and were met with perfect silence—my jaw must’ve been through the floor at this point. I took in the surroundings; in front of me was a seemingly endless row of Japanese teenagers in uniform, to my left, more of the same and to my right, an American flag and a Japanese flag hanging on either side of a podium. The moment was surreal.